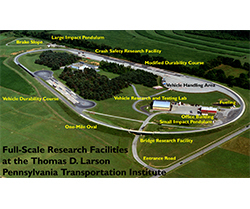 The Larson Institute's full-scale Transportation Research Facilities include a test track facility designed to accommodate a broad range of research activities. The facility features a 1-mile oval, a large vehicle handling area, and a vehicle durability-testing course that allows additional pavement, vehicle, and appurtenance testing. The facility includes a special test section where test surfaces can be installed on a temporary basis for testing. Current activities include crash testing of anti-terrorist barriers and comprehensive testing of new bus models. It (together with the City of Pittsburgh) was designated in January 2017 as one of 10 U.S. Department of Transportation autonomous vehicles proving grounds in the country. In 2011, the Center was granted American Association for Laboratory Accreditation (A2LA). 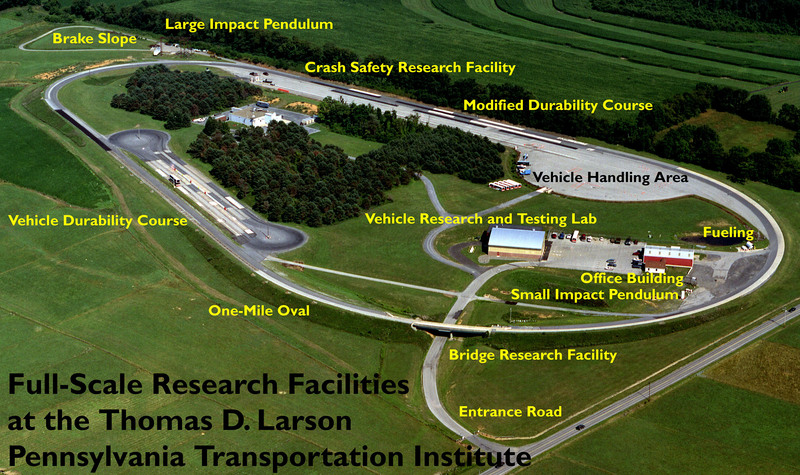 The Thomas D. Larson Pennsylvania Transportation Institute is Penn State’s transportation research center. Since its founding in 1968, the Larson Institute has maintained a threefold mission of research, education, and service. The Institute brings together top faculty, world-class facilities and enterprising students from across the University in partnership with public and private stakeholders to address critical transportation-related problems.